A cop became so enraged by a man practicing his first amendment right to film that he attacked him, handcuffed, and detained him. Vallejo, CA — In the land of the free, there are ostensible checks and balances which are in place to prevent corrupt and power drunk government officials from overstepping their authority and depriving people of their rights. The largest ostensible restraint on this power is the constitution. However, as TFTP has reported for years, despite the fact that police swear an oath to uphold this constitution, they are all too often the ones who ignore it. As the following case illustrates, to many police officers, the oath they took to the constitution may as well be dog excrement that they scrape from the bottom of their boot. 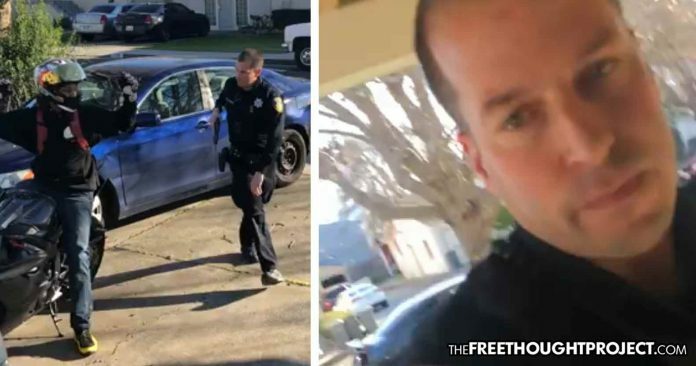 Officer David McLaughlin clearly forgot his oath last month when he was recorded tackling, handcuffing, and temporarily kidnapping an innocent Marine veteran for practicing his First Amendment right to film the police. The egregious act was captured by Adrian Burrell and is nothing short of enraging. As the video begins, officer McLaughlin has his gun drawn and is pointing it at Burrell’s cousin while accusing him of being some guy he saw speeding earlier in the day. As he assaults the man on the motorcycle with a deadly weapon, McLaughlin notices that he is being filmed. Apparently, stopping a man from filming him then became more important than going after an alleged speeder, so the cop turned his attention to Burrell. “I am a Black man born and raised in Oakland, California who was physically attacked by Vallejo PD officer David McLaughlin, last Tuesday,” Burrell wrote on Facebook, explaining the incident that took place on January 22. “This unfortunate circumstance put me in a situation where if I was to defend myself, then I would have been a hashtag. Or worse, my death would have been ignored or excused on the premise of McLaughlin’s irrational fear,” he wrote. As Burrell explained, he placed more than enough distance between himself and the officer and gave no reason for the officer to become fearful. “From roughly 20 ft away, with a railing between myself and the officer, I started filming with my phone,” Burrell noted. But this cop clearly hated the fact that someone would dare document his behavior in public, so he chose to assault Burrell instead of upholding his rights. Burrell was then temporarily kidnapped and thrown in the back of a squad car. According to Burrell, that’s when McLaughlin figured out he had no criminal record whatsoever and was an honorably discharged Marine—who, coincidentally, also swore an oath to uphold the constitution. When McLaughlin realized he had nothing on which to arrest Burrell, his temporary kidnapping ended. He said I was going to jail and detained me in the back seat of his car. Would I have gone to jail if I weren’t a vet with no criminal record? When the officer realized I am a Marine, he told me if I wasn’t a vet I’d be going to jail. Does that mean that if I had not been a vet, he would have put me in jail for not breaking the law? Because I am a vet, does that mean my life is more valuable? Military service does not warrant special treatment. Lack of military service does not justify mistreatment? We could not agree more. For his actions in the video you are about to watch below, McLaughlin is now the subject of an internal investigation. However, if history is any indicator, the chances of any actual accountability—outside of the taxpayers of Vallejo being held responsible in the form of a lawsuit—are slim to none. Luckily for Burrell, aside from a few minor injuries, his life will go on. Others who have come across McLaughlin, however, have not been so lucky. As the Mercury News reported, in August 2017, McLaughlin was one of five officers to fatally shoot Benicia resident Jeffrey Barboa as he walked slowly toward officers, a machete-like knife raised above his head. Barboa was struck 41 times and died. A coroner’s inquest jury later ruled 8-4 his death was a suicide. McLaughlin was also sued in 2014 by a man who alleged excessive force, was unlawfully arrested, and says McLaughlin falsified the report. Also, last August, McLaughlin was caught on bystander video as he held a man at gunpoint who was trying to celebrate his son’s 14th birthday. Over a verbal confrontation, McLaughlin held Santiago Hutchins, their 14-year-old son, and his pregnant wife at gunpoint. He then proceeded—with the help of his brothers in blue—to beat Hutchins so gravely that he was hospitalized. When police refuse to have their public service documented and this refusal morphs into kidnapping and assault, something has gone seriously wrong. No one should ever face persecution for their first amendment rights—especially in the land of the free.